Take a 10 day trial for just $1! "The quickest and easiest way to both LOOK and FEEL younger! The Five Rituals are not only fun, but incredibly powerful. I've seen amazing results after just three weeks, and intend to use this system for years to come. Brilliant!" "As an author, an interviewer, and a director, I need all the energy I can muster. 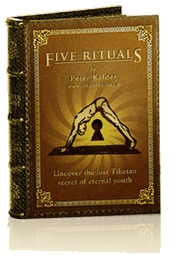 The Five Rituals program is fantastic! Iíve been following it for weeks now, and feel fantastic. Not only am I looking better, but Iím healthier and enjoying an all-natural life high. I highly recommend the Five Rituals package!"